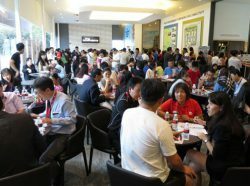 628 Units Executive Condominium by Hoi Hup Comprising 3/4/5 Bedroom Units. I would like to view Rivercove Residences EC showflat and I would like to know more about the pricing and available units. These prices are accurate but is based on the last available units only! In the event it has been sold, the price is subject to update. To purchase at this listed price, hurry and contact us now! 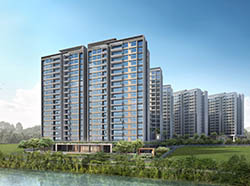 Rivercove Residences is a 99-year leasehold, executive condominium, located at Anchorvale Lane in District 19. This 99-year executive condominium comprises 628 residential units of 3/4/5 bedroom units. 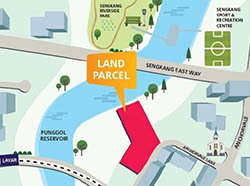 The site plan shows you the entire map of the area, including the facilities around the compound, location of the blocks and stack number of the units. Floor plan shows you the internal layout and configuration of a unit. EC buyers have to obtain mortgage loans from banks or financial institutions. HDB do not provide housing loans for the purchase of EC. The maximum loan you can obtain is 80% of the purchase price of the EC unit. Register your interest for Rivercove Residences Executive Condominium here. Registration is free and takes just a minute. There are no obligations when you submit an E-Application. Submit for priority now. Copyright © 2018 ExecutiveCondominiums.com.sg | Rivercove Residences Executive Condominium Singapore. Do not reproduce any information within this website without permission.